Blondie and Brownie: 'Tis the Season to Hit the Holiday Markets! The Rubyzaar booth sells not only lovely fair trade items, but also delicious cookies flavored with Vietnamese coffee, sun dried peaches, mango, and crystallized ginger among other goodies. When I got there late-ish on a Saturday night they were nearly out of cookies. I settled for a "Cherchez Renee" which was sundried cherries and dark chocolate chunks. 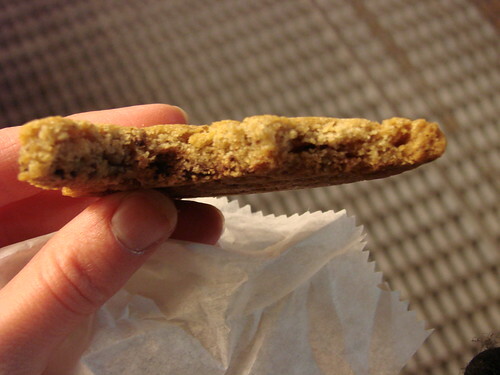 The cookie was soft and chewy with just the right amount of sweetness. As a testament to its tastiness, please not that the above photo is of a cookie that is 2/3s gone. 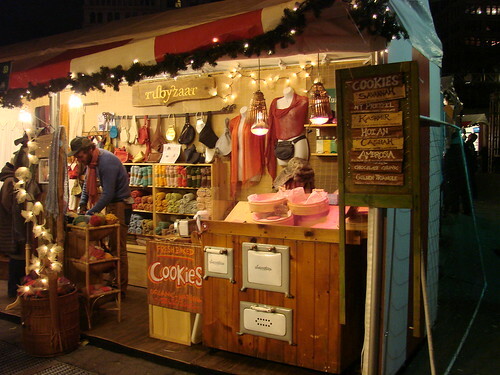 You can find Rubyzaar at the Union Square Market from now until December 24th. OMG I had one of their Vietnamese coffee and chocolate cookies this weekend and it was amazing. Kind of like a grown up chocolate chip. I've been dreaming of it ever since.